Infrared Thermometers infer the temperature of an object by measuring the infrared thermal radiation emitted from the object. Objects at thermal equilibrium must balance the energy that is entering the object with the energy that is leaving the object. Often, the energy leaving the object is emitted as electromagnetic radiation. 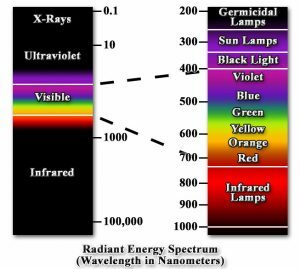 Infrared radiation has longer wavelengths than visible light, so we cannot see it. The higher the temperature of an object, the more infrared radiation it emits. This means that the temperature of the object can be calculated by the amount of emitted infrared radiation. Emissivity is the ability of an object to reflect thermal energy and is the ratio of relative emissive power of a blackbody at the same temperature. A blackbody is an ideal body that completely absorbs all incident electromagnetic radiation. Reflective, shiny, objects have low emissivity, while non-reflective, dull, objects have high emissivity. Most items (such as wood, paint, plastic, concrete, cloth, and rubber) have an emissivity near 0.95. 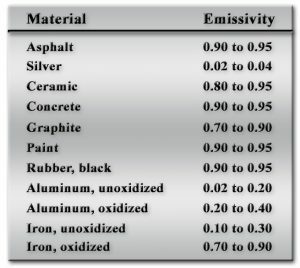 Metals, such as aluminum and silver, have lower emissivity values. 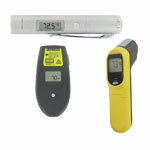 Infrared thermometers may have a fixed emissivity of 0.95 or an adjustable emissivity range for different materials. 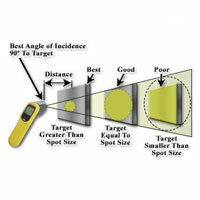 An important specification of infrared thermometers is optical resolution, usually termed as the distance to target size or distance to spot ratio. 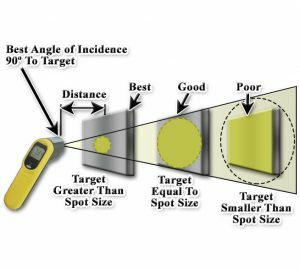 This is the ratio of the distance to the object and the diameter of the temperature measurement area on the target. A thermometer with a 12 to 1 ratio will measure a 1” diameter area on an object when the thermometer is 12” away from the object. It is always best to take readings with the thermometer at 90 degrees to the object being measured. Infrared Thermometers are very popular, as they do not contact the surface being measured and can measure from a certain distance away from the object. Often, they have a laser sight for guidance to show the area being measured. They are also very quick, with response times of about one second.